The Wonderbar is the latest beauty fascination in the US. It is a special soap that heals and detoxifies the skin. The creators of the product actually say it is not a "soap" by definition due to its pH balance, but it is a toxin-clearing treatment for your skin. To begin, the Wonderbar has mostly all natural ingredients, thus making it a green skin product. It was listed in the Mach 2010 issue of Body + Soul magazine as being a liquid cleanser for your skin — the opposite of a harsh bar soap. The first ingredient on the back of the packaging is Disodium Lauryl Sulfosuccinate (DLSS). After much research and finally asking a pharmacist, we found out that DLSS is a mild de-greaser and is not harsh like Sodium Laurel Sulfate (SLS), which many people are allergic to. Instead, with DLSS, the sulfa is locked in the chemical compound, thus not reacting like SLS and making for a very mild ingredient. The Environment Working Group (EWG) listed the DLSS in the Wonderbar as least hazardous. The other natural ingredients are wheat starch, paraffin, talcum, clay, water, glycerin, fruit oil and chamomile extract to name several. The creators of the Wonderbar report the ingredients originate from Malaysia. Found in the MOOR substance of the bar are 700 herbs and plants. 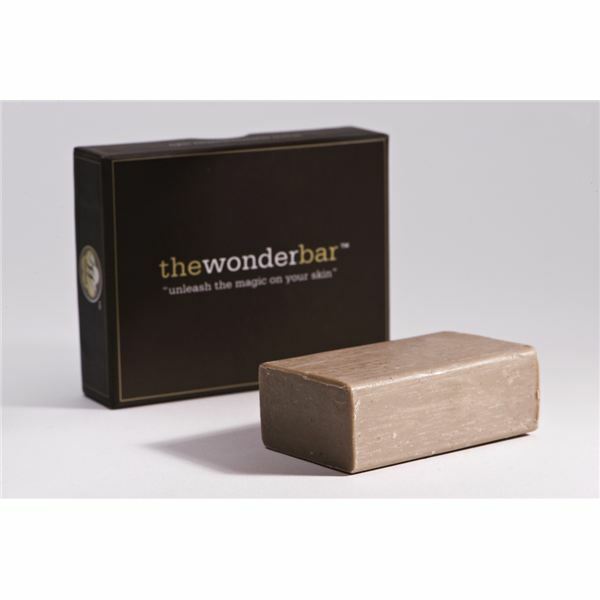 The goal of the Wonderbar is to eliminate toxins in the skin by bringing them to the surface and flushing them out. Once all of the built up toxins are flushed out, the skin will restore to its correct pH balance between 4.5 and 6. For example, if you’ve been using a lot of chemicals on your skin for years, it may take a while to flush out the toxins. This stage is referred to as the Healing Crisis. What is the Healing Crisis? The Healing Crisis is the stage when you first begin using the bar and your skin is flushing out all the toxins. From the forums we researched, we found the average Healing Crisis lasts about a week or so — for some a little less and for some a little more. And the occasional lucky person does not go through this stage at all. When your skin flushes out the toxins, thus correcting the pH balance, it is not in its prettiest stage. That is why it’s best to wait for a time period when you don’t have a big event coming up. In other words, it’s best not to start using the bar right before your wedding, graduation, prom, family portrait, etc. You can apply the Wonderbar to wet or dry skin. Work the bar into a lather, it will look like lotion, and gently massage it onto your skin. Leave it on for three to five minutes and rinse off. There could be more side affects; however, as we checked beauty forums, no one reported anything out of the ordinary or that wasn’t listed here. It is recommended to keep using the bar until you see radiant, perfect skin. We also highly recommend visiting the FAQ page on the Wonderbar’s website (wonderbarusa.com) because there are a few restrictions to using the bar i.e. no mineral makeup, only physical sunblock, etc. The bar costs $40 (a bit pricey) for a small bar. However, forum users report that it lasts anywhere between six weeks to two months. It’s best not to get the entire bar wet every time you use it, so it lasts longer. You can purchase it on the Wonderbar’s website. Please note that the author of this article is about to try the Wonderbar soap for herself. She will report back in a few weeks how this product worked for her. Please stay tuned! Learn about the Wonderbar soap and find out if it really works. We discuss the natural ingredients of the bar and the Healing Crisis stage, along with the severity of it. We provide a review of the bar after using it for two months, so you can decide if it’s the right skin choice for you.